On a “slow” day, most families have more to do than they have time to do it. Fitting dental checkups at multiple offices on different days of the week into these schedules can be a real struggle. 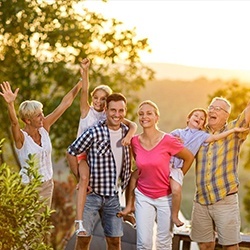 Rather than stretching yourself thin visiting numerous practices, Bluff Creek Dental invites you to experience the family dentistry difference. We welcome patients of all ages to visit our comfortable, state-of-the-art dental office. From the age of 1 to 101, we’ve got your oral health and hygiene needs covered. That means you can take some extra time to do something even more fun than visiting the dentist with your family! We want to make caring for your smile fit your schedule. We are happy to set aside a block of appointments to see your whole family on the same day. No need to schedule multiple appointments or take extra time away from work, school, and other daily tasks. In addition to removing the need to juggle multiple appointments at numerous dental offices, our family practice is comfortable for you and your child. A pediatric practice is great for kids, but parents don’t always feel as comfortable in these brightly colored offices full of children and toys. At Bluff Creek Dental, we have comfortable spaces for kids and adults. Another reason why kids without any serious concerns with their dental development should see the same dentist is consistency. The more often Dr. Crowley examines your smile, the more familiar he is with your normal appearance and function. Because he notices even small changes right away, Dr. Crowley is able to diagnose oral health concerns in the earliest stages. This early diagnosis and treatment significantly reduces patient risk for advanced dental damage or decay. Many parents think that a child has to visit a pediatric dentist. However, unless your child has very serious concerns with their dental development, a family dentist will be able to provide safe, effective treatments. If your child begins dental care with a pediatric dentist, he or she will need to make a transition into the an adult practice around the age of ten or eleven. For many kids, this can be very stressful, and the switch from a pediatric office to an adult practice is one of the reasons many young patients experience anxiety associated with the dentist. Our family dental office will make dental care comfortable and free from fear, pain, and stress for your child. Our friendly, gentle dentistry team makes visiting the dentist a treat! At our Oklahoma City dental office, we provide a wide range of services that meet every patient need with an emphasis on prevention. That means we partner with you to keep your smile whole and healthy with regular dental checkups and teeth cleanings. These twice a year appointments typically allow us to prevent major oral health issues before they start, and diagnose and treat other concerns in the earliest stage. That means you maintain a whole, healthy smile for a lifetime.